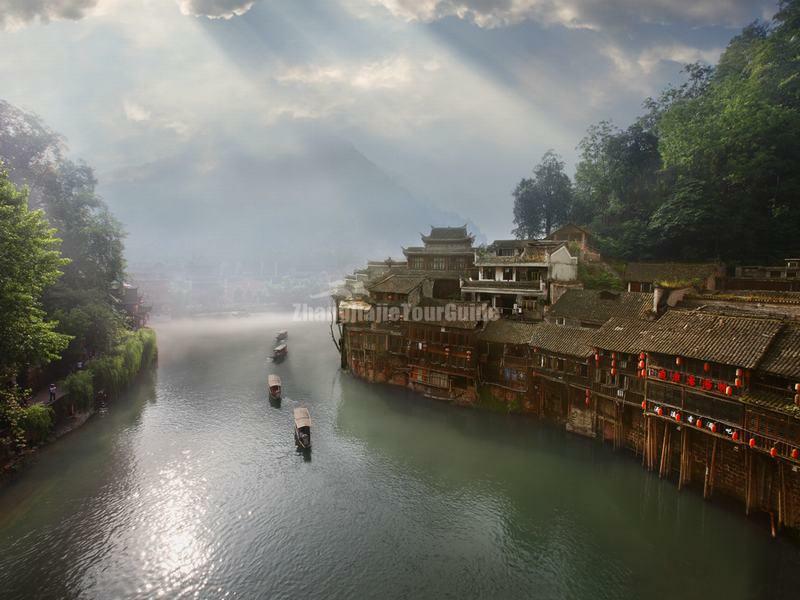 Fenghuang Ancient City, also know as Phoenix Ancient Town, is located in Xiangxi Tujia and Miao Autonomous Prefecture, in southwest of Hunan Province. 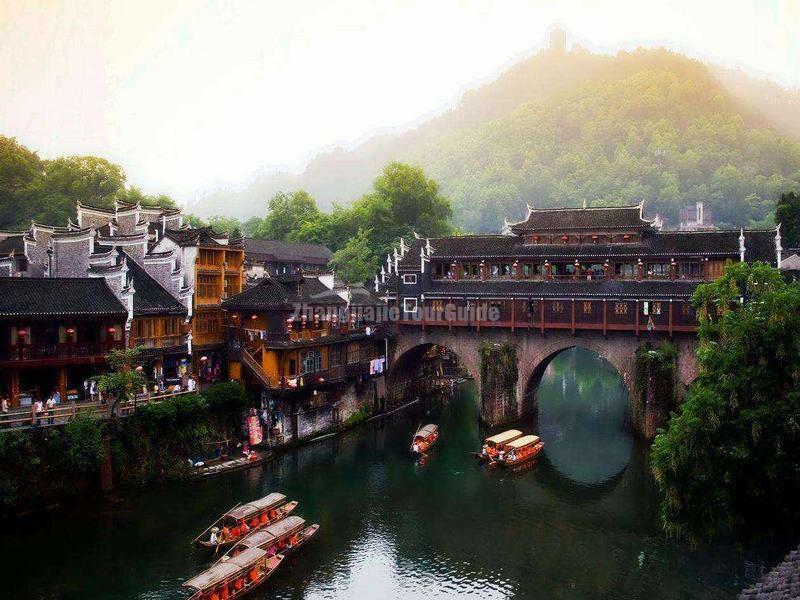 It is one of the smaller counties in Hunan, but now it is known as the most beautiful ancient town for its long history and well-preserved appearances. The name of Phoenix (Phoenix in Chinese Pinyin is Fenghuang) town mainly derived from the Phoenix Mountain which is in a phoenix shape. Fenghuang Ancient City has basically maintained the layout and original appearances of the Ming and Qing dynasties to this day. There preserved in the ancient town zone over 200 ancient residential buildings, some 20 large or small streets, 10 ancient lanes and alleys, as well as ancient town walls, ancient town gate towers, ancient leaping rock, ancient wells, ancient rainbow bridges, ancient temples of literature, ancient temples of poems, ancient ancestral temples etc., all of which are by and large preserved in their original state. The residential environment featuring harmony between human and the mountains, waters and the town has been preserved in its original form up to now. 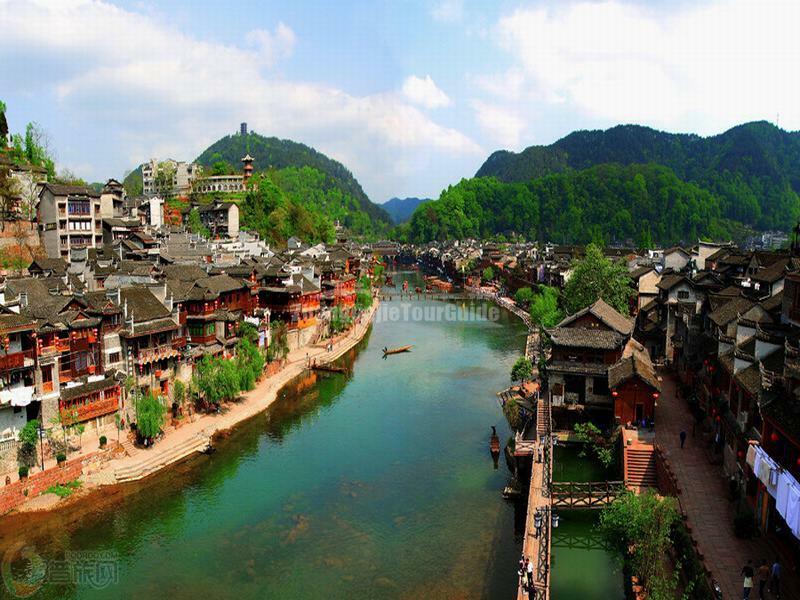 Stretching diagonally from the northwest to southeast of the Fenghuang Ancient City, Tuo Jiang River is a life force of the local people. Here in its waters women wash their clothes and the men fish with their nets, while on the bank food is prepared in much the same way as it has for centuries. The river also provides a means for boatmen to support their families by ferrying visitors up and down stream for sightseeing. Taking a boat trip along the Tuo River is a great way to have a better view of the unique wooden houses (Diaojiaolou) of the ancient city. It lies above the Tuo River, crisscrossing with the National Street, and makes up a folk picture of the ancient town’s marketplace. Hongqiao is an ancient building with a history of more than six hundred years,It was built at the beginning of Hongwu in Ming Dynesty,and consists of two floors. The first floor is a capacious pavement for people to come and go, with make shops on both side, selling all kinds of folk arts and crafts, and local products,etc. Live applause of hawking and whispers of bargaining makes up a Feihuang " riverside scene at Qingming Festival". The second floor is the belvedere and also demonstrating the tea ceremony.Go up to the second floor, overlooking the whole beauty of phoenix town,savoring a cup of tea, you will fell completely relaxed and joyful. The museum is another humanities landscape in this ancient town.Here,it displays a toaristocratic family-Chenbaozhen family's history cultural heritage, belongings, photos of the passed, pictures, material, books, documents, etc.which were donated by Chenbaozhen's descendants. The museum also displays more than 500 kinds of rock specimens and paleontology fossils millions of years ago.Through stereo sand table combining Chinese and English two languages,the modern technology such as electricity, light, sounds, etc. are used to fully display the geological landforms of phoenix national geological parks and the evolution of earth and rock layer evolution, biological evolution etc. Shencongwen is a famous litterateur,historian and expert in ancient artifacts in China,who is also known as the father of the native literary world. His valuable creation of more than 900 million words works contribute a lot to the research on china and the Xiangxi area.The residence was built in the 5th year of Tongzhi,Qing Dynesty(1866),it is a wooden courtyard dwellilngs and now listed as provincial units of cultural relics protection. Shencongwen was born in Dec.28th,1902 and spent his childhood and adolescence here. It is situated in a lane at north Wenxing street an about 200meters away fron Tuo River.The residence is also a wooden-tiling courtyard in a southern archaistic style and full of Miao amorous feelings.On June 25th,1689(Lunar Calendar), Xiong Xiling was born and spent his childhood here.In 1913,he was elected as the first prime minister of the Republic of China,but later he was forced to resign due to his against of the Yuan Shikai's restoration of the monarchy.In his later year,he devoted himself to the charities and education career.in 1920, he set up the famous Xiangshan infant-asylum.Xiong xiling passed away on Dec.25,1937,and the republic government held a state funeral ceremony for him. It was founded in the 16th year of Daoguang, Qing Dynesty(1836), and was a wooden courtyard covering 770 square meters.The stage was built with single eave, and the pillars were all carved with dragon and phoenix. The gable was in cat back arch,the windows, doors and eave decorations were all hollowed out with flowers, and the whole building had a distinctive national character and high artistic value of the architecture. Wangshou Palace,also called Jiangxi Assembly Hall,was built during the 20th year of Qianlong, Qing Dynesty, covering 4000 square meters.It consists of the tri-gate,stage,main hall and Xiachang pavilion. The structured and unique style,attic stage, great pillar,etc,show the exquisite workmanship at that time.In 1999, it’s listed as state county units of cultural relics protection.Now the Wanshou Palace is the folk museum of Phoenix town:the first floor is folk customs hall and hundred years chamber of commerce hall;the second floor is the art gallery of Huang Yongyu. It is a typical southern courtyard built by Pei Shoulu,a businessman from Fengcheng, Jiangxi province in 1884.The pheonix rose at the beginning of Qing Dynasty and become the capital of the great west Hunan. The Moving-in of the military and political leaders not only bring officials,but also vendors,peons,scholars,artificers,etc.Pei Shoulu became the richest man in Phoenix town,he set up his own business entity “Pei Sanxing”and built this ancient courtyard.From this building,you will know how glorious his family was and how prosperous the phoenix town was. 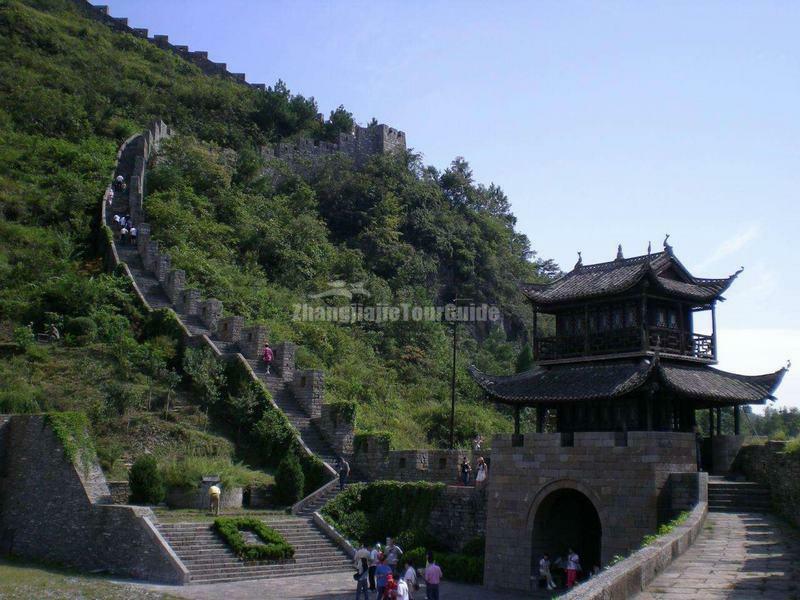 It's also knows as "Miaojiang Wanli Wall" and a mililtary historical remains in Ming and Qing dynesties. it had witnessed the ethnic disputes and peace for hundreds of years. The wall is three hundred and eighty-two miles long,starting from Tingziguan and sreches to the north Magpie Camp, and the main part is across the ancient phoenix town.The wall is 3 meters high,2 meters wide at the bottom and 1 meter wide at the top, and mostly built along the mountain ridge. On the way,there are more than 800 platform, fort, residential towers,etc.for station troops and defense purpose.The Southern Great Wall is part of China Great Wall and also should be listed as the world cultural heritage. 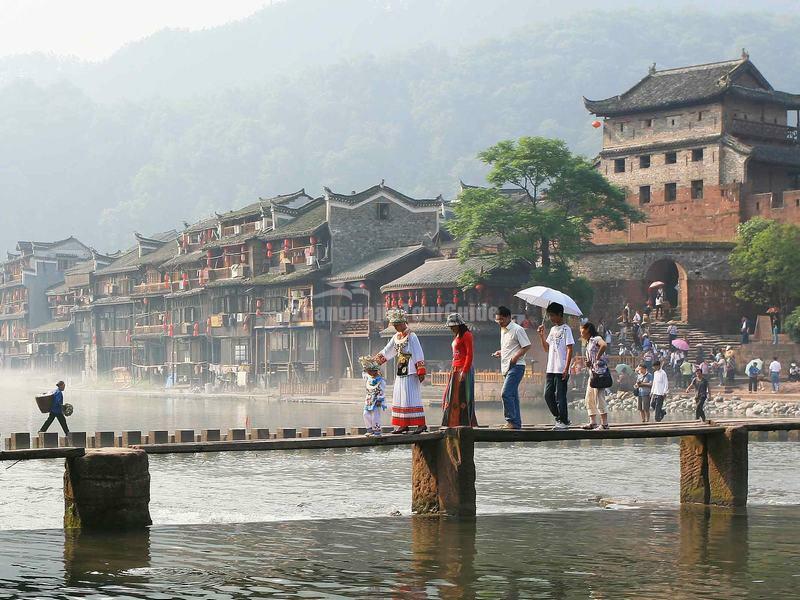 It will take 40 minutes from the southern gate of phoenix town to Shanjiang town.Passing the Miao Singing stage, walk for about 500 meters and you will arrive the Miao Village.The most famous scenic spots are Miaoren cave,waterfalls,U-shape valley,heavenly bridge, the plank road built along the face of the cliff,etc. Zaogang Miaotse is another important spots in Miao village,you will enjoy both natural scenery and folk customs. It is 25km away from the ancient city which preserves the integrity and with a history of 1300 years.It could be traced back to Tang Dinesty. Huangsiqiao was bulit up in bluestones and even huge blue rocks were used to built the circumvallation, some rocks are even as heavy as 1000kilograms.There are three gates in three directions: east, west and north.In 1983, it's been ranked as the provincial key cultural relics protection site. It is only 6km away from the ancient city of Phoenix. It is a typical karst cave with thousands of omniform stalagmites. The length of the cave is about 6000 meters and consists of five main sightseeing area:the Ancient Battlefield,the Gallery,the Heaven,the Dragon King's palace and the Yin-Yang River. Here you can not only see odds rocks and stones, but also waterfalls,which making a magnificent panorama. 1. Never open your umbrella while visiting the local peoples' houses and don't step on the door sills. 2. Don’t sucking up to the married women in the town or whistle as they believe it is only an asking for trouble and offend the ghost. 3. Coins can not be used in the ancient town so please bring paper money. 4. Aware of the travel traps. Taps are everywhere can be found although people will not force you do something. Take care for the butter-tonsiled drivers, service suppliers and never trust on cheap tickets or the so-called perfect extra itineraries. Don't accept the free services or gifts like the joss sticks and candles burning at a temple as you will finally pay a lot for it.